President Donald Trump, DOT Secretary Elaine Chao and other senior leaders from the federal government convened the “Roads and Rail Regulatory Reform Event” at U.S. DOT headquarters today, calling for a reduction in federal regulations for planning and building infrastructure projects as part of the administration’s Infrastructure Week activities. He also announced the development of a council to help cities and states navigate the federal approval process, an online dashboard to track major projects through that process and a new office in the Council of Environmental Quality to “root out inefficiency and clarify lines of authority” among other things. Prior to the speech,Trump and Chao convened a group of state departments of transportation heads for a listening session. According to DOT officials, “the purpose of the event is to ensure that the administration’s policies on infrastructure are aligned with the actual owners of the infrastructure,” and would address several issues, including rural infrastructure, permitting reform, transformative projects, drinking and wastewater, transportation and energy. APTA leaders continue to strongly advocate for public transit to be included in Trump’s proposed infrastructure investment plan. In her remarks, Chao said DOT was reviewing its existing policy statements, guidance documents and regulations to identify obstacles to transportation infrastructure projects and invited ideas and comments. “As part of this review, the department invites affected stakeholders and the public to identify non-statutory requirements that the department imposes and that should be removed or revised,” states the request for input published in today's Federal Register. See details here. Sec. Chao at left and President Trump; attendees at right. 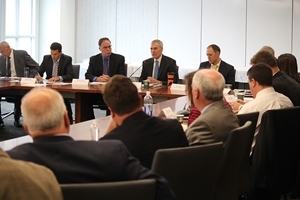 More than 60 participants representing FRA, commuter rail operators, technology and other PTC-related businesses and the Association of American Railroads met June 7 at the APTA offices in Washington, DC, for an all-day summit to discuss progress and lessons learned in PTC implementation. APTA Acting President & CEO Richard White and FRA Acting Administrator Patrick Warren, center, at the PTC Summit hosted by APTA. APTA Acting President & CEO Richard White and FRA Acting Administrator Patrick Warren welcomed attendees. FRA staff, including Chief Safety Officer Robert Lauby, presented the agency’s PTC status report. Participants discussed technological challenges of PTC implementation, staffing and training issues, locomotive and equipment requirements and overall interoperability between passenger and freight railroads. They also discussed the importance of maintaining an exchange of information among agencies nationwide and FRA and making necessary long-term plans for operating conditions and financial impacts. Randy Clarke, APTA vice president-operations and member services, and Lou Sanders, senior director-engineering services, reported on the Interoperable Electronic Train Management System (I-ETMS) Users Group. APTA is accepting nominations until July 17 at 5 p.m. (eastern) for 12 seats on the APTA Executive Committee and 10 seats on the Board of Directors. Consistent with APTA’s Sustainability Commitment, this year’s nomination process will be entirely online, including the submission of all letters of support. Information about the nomination process can be found after logging in here. With the recent passage of the revised bylaws, APTA encourages members to get involved in the association’s governance and submit a nomination. APTA officials strongly encourage members to apply for more than one position. FTA has developed Calculating Performance Measures and Setting Targets, a new web-based training course to help public transit agencies complete their Transit Asset Management (TAM) performance management calculations and reporting. The online course, available on demand, covers such topics as performance measurement and assessing asset conditions. To register, follow the instructions here, then visit the Transportation Safety Institute’s Learning Management System. Join public transportation agencies throughout the U.S. and participate in APTA’s annual Dump the Pump Day, June 15, which encourages people to ride transit and save money, reduce congestion, strengthen their communities and help eliminate harmful carbon emissions. Find easy-to-use resources, logos, fact sheets and sample documents in APTA’s online toolkit. July 22-25: APTA Transit Board Members & Board Support Seminar, Palmer House Hilton, Chicago. To register for the seminar, click here. Windy City’s Vintage Train: The city of Chicago turned out to celebrate the 125th anniversary of CTA’s “L” Line, an elevated wooden train that helped “expand the city and create its character,” reports this Chicago Tribune story also featuring videos and a photo gallery. It’s a Train, It’s a Bus: Railcar manufacturer CRRC is building what it calls the world’s first driverless, rail-less “bus-rail combo” rapid transit system. The vehicle has the same profile as a train but runs on rubber wheels on specially marked asphalt. Read more and watch a 1:04 video in this Popular Mechanics article. On His Toes: A dancer with American Ballet Theater leapt onto the tracks of the New York City subway to save a homeless man who had been pushed. He said his dancing prowess enabled him to scramble back to the platform ahead of an approaching train. The New York Times has the story. That’s a Breakthrough: The tunneling boring machine dubbed "Angeli" that’s digging the light-rail tunnels for LA Metro’s $1.75 billion Regional Connector project recently broke through to the Grand Ave/Bunker Hills Station. Watch a 27-second video of the 1,000-ton TBM at work.